An air ambulance had to be called to the scene of the two-vehicle road crash in Co Down on January 5, prosecutors said. Details emerged as bail was refused to a 48-year-old man accused of going equipped for theft and motoring offences connected to the pursuit. Barry Thompson, a mechanic from Ballynahinch Road in Hillsborough, also allegedly had pepper spray recovered from the Ford Transit. Police began tracking the van after it failed to stop for them between Ballynahinch and Hillsborough, the court heard. Crown lawyer Conor Maguire said other PSNI officers in an oncoming vehicle recognised Thompson as the driver. The mid-morning pursuit continued along country roads before Thompson attempted to overtake a Citroen C1 car on the Old Ballynahinch Road outside Lisburn, according to the prosecutor. He contended that impact between the vehicles caused the C1 to spin out of control and strike an oncoming Volkswagen Caddy van head-on. Both those vehicles sustained severe frontal damage, with two women in the car and the driver of the van all taken to hospital, the court was told. Meanwhile, the Transit had mounted a grass verge and hit a lamppost before coming to a halt. Thompson was arrested at its passenger side as searches were said to have revealed the cloned plates and a canister labelled pepper spray found inside. He faces charges of possessing a prohibited weapon, dangerous driving, fraudulently using a vehicle registration mark, going equipped for theft, driving while disqualified and having no insurance. 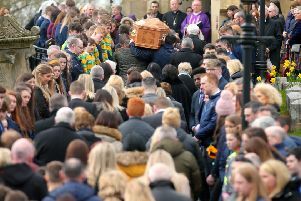 Disputing claims that Thompson had been behind the wheel of the van, defence barrister Joe Brolly argued that the first policeman on the scene reported seeing another suspected driver get out and flee. Mr Brolly submitted that accounts given by that officer and his client were being “airbrushed” out of the case. “It’s a very weak prima facie case where the evidence is riddled with contradictions,” he said.